The Specialized Operations Response Team or SORT was established to provide the detention facility a specialized group of deputies to handle situations that may be beyond the scope of regular jail staff. Membership in the SORT team is voluntary and very selective. Team members must pass a rigorous physical standard, a review of past performance, a recommendation by their immediate supervisor and a screening by current team leaders. Candidates must be able to display a psychological and physical ability to deal with extreme stress situations while maintaining an appropriate and controlled response. All members perform their regular duties as deputy sheriffs and respond to emergencies as needed on an on-call basis. Members are available 24 hours a day, seven days a week. The SORT team performs a variety of tasks and deal with numerous situations that may occur both inside and outside the facility such as, day room clearings, riot control, barricaded inmates, transport of high risk inmates, protests, and facility shakedowns. SORT has a variety of less lethal options at their disposal to aide in bringing a safe resolution to high risk situations. Some of the less lethal weapons utilized are OC, Stinger grenades, 40MM launchers and Taser. 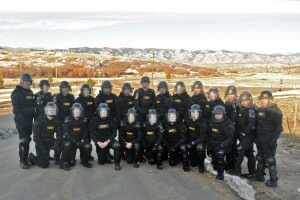 Team members receive specialized training in the use and deployment of all less lethal weaponry and must maintain their proficiency of all less lethal weapons by recertifying yearly.